While watching the RE market two important numbers to pay attention to are Inventory (Supply) and Demand (no surprises here). Inventory is based on the active number of houses for sale in the market and the number of houses sold in a given period. The demand is driven by seasonal factors, underlying job market situation and to a degree certain macroeconomic such as interest rates, and geopolitical factors. Inventory in the Bay Area peaked in late October 2018, inventory reduced during the holidays and started to pick up since the beginning of the year. The relative rise in Inventory with not much change in demand will see houses sitting on the market longer, lower prices and more options for buyers. However, inventory is still hovering around 2 months supply which is much less than the normal inventory of 6 months, this is still considered a Seller’s market. So, buyers should not expect any drastic changes to housing prices in the near term, especially with interest rate still very low there will be continued demand. As noted earlier there is no fundamental change in the driver of demand for houses, the Bay Area job market, with unemployment low and companies thriving. The only variations in demand will be based on seasonal factors and with some buyers waiting for an anticipated “crash” in the housing market. The buyers are still facing an inventory crunch and there are pockets of areas where multiple offers have been noticed. 1. Tesla showing signs of struggle with a 7% layoff and making some drastic changes to it’s sales channel. If Tesla continues to struggle and cannot bring the low-cost model quickly into the market, expect trouble in the Fremont and surrounding area housing price with more layoffs. 2. Toll Brothers, the largest national builder announced that there has been a 24.3% quarterly dip in new orders, this is big news. The permits for new housing charts have been showing a downward trend pointing to weakening demand. Both pointing to continued “softening”, from my perspective this is much-needed breathing space for buyers, I would like to see inventory stabilizing at a reasonable number of 4-5 months. To put the Bay Area supply-demand into one easily recognizable chart, I have created the weekly Pending/Active chart for the entire Bay Area (contact me @ 408.420.0646 or gbangalore@intero.com if you need the chart for your specific area). On this chart, a number 100 means that weekly pending = active, which means houses are gobbled up as they come, a number greater than 100 means the houses are sold even quicker and a number below 100 means it is taking longer to sell. Use this graph to understand the trend and nothing more. 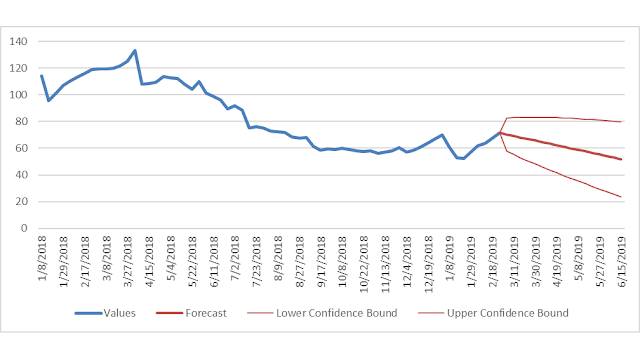 As you can see the trend since the beginning of 2018 has been downward, meaning the housing market is getting slower, though there has been an uptick in Jan-Feb 2019 due to buyers coming back after the holidays as well as a dip in interest rates. I expect to see a continued uptick during Spring and summer 2019 as long as the current economic situations prevail. I appreciate your questions or comments, please do send me in your feedbacks. In the last 6 months homes have sat on the market longer (compared to the first half of 2018) and prices have been slashed. 1. High Prices Home prices grew at a higher rate than the rate of inflation and incomes in the last few years. 3. Wall Street Effect The noise about another recession and a dip in stock prices has left many buyers who were planning to use their stock options for down payment with less money and tempered their purchase. Besides, the psychological fear such events causes. 4. Migration Bay Area is the top region in the nation for outward migration. Though many pockets in Bay Area have also seen net positive migration. 1. Chinese investment down According to reports Chinese investment in RE decreased by 50% from 2017 levels. Slowing the home prices. It’s a good time for both buyers and sellers.prices have declined 5-10% and with minimal or no bidding war. Sellers still benefit from low inventory and relatively hot demand.